If you follow me on facebook than you might already know that I taught myself to crochet last week. I've been trying to get a tutorial up but was having problems taking photos of myself using two hands and focusing the camera until I awkwardly managed to stack a bunch of books and old CD cases together. 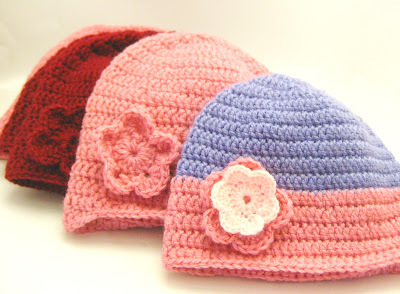 So I'm no expert on crochet or anything but I thought a really basic step-by-step tutorial on how to crochet a beanie by a beginner might be helpful for some of the other beginners out there. I accidentally inserted the crochet hook into the wrong part of the stitch and made up a new stitch altogether (I think), I'll show you photos at the bottom of the post. Basically I decided to teach myself to crochet for charity. I'm hoping to go on a medical student elective at the Mae Tao Clinic(MTC) at the end of the year on the Thai/Burma border. Do you ever read something sometimes and become inspired to do more, do something better with your life? I had one of those moments when I read up about the MTC, probably around the time that I decided I really really enjoyed women's health. I think as a medical student in a developed country where medical assistance is only a phone call away, hospitals will dependably have the medications required for treatment and where home birth is a choice and not an inability to access proper healthcare, it is easy to forget what medicine is really all about and why we chose to study it in the first place. The MTC is one of those really amazing inspiring places. It was set up over 20 years ago by Dr Cynthia Maung, a displaced Burmese doctor, as an interim solution to the situation in Burma at the time. The MTC treats over 150,000 cases a year of which 45% come direct from Burma for treatment because Burma is ranked 190th out of 191 countries by the WHO for their healthcare provision and its outcomes. The funding from the MTC comes almost entirely from donations, many of which have fallen short this year. Last year they received 112 million Thai Baht (THB), the equivalent of $3.39 million AUD, the majority of which was from donated by governmental agencies and foundations. The decrease in funding has been attributed by the clinic’s spokeswoman to “a combination of the economic downturn in the West as well as a perception that things on the border should be okay because the media on Burma is all about political changes.” As a result the MTC is currently 10 million THB ($300,000 AUD) short on its budget, despite a voluntary 20% cut to the already low staff salaries, currently 3200 THB (97 AUD) per month. So I'm hoping to spread the word. For those of you who can and would like to donate to the MTC or read more about them go here, they do a much better job of explaining what they do and how. And for those of you who crochet or knit, the Thai/Burma border can get quite chilly in their colder seasons and their newborns could do with some extra warmth, items can be sent to them or I can take them with me at the end of the year. And for those of you who would like to learn how to crochet, for the MTC or other charities or you actually know a baby who would like a beanie the step-by-step is right after the jump. 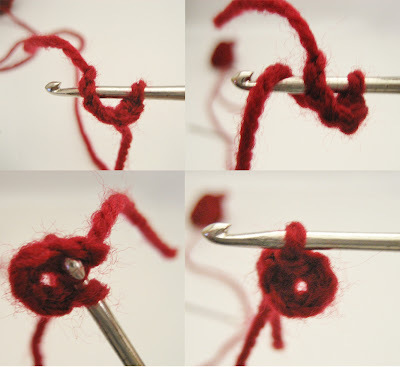 Put the loop of the knot onto your crochet hook - pull the long end of the yarn to tighten it, then pull the short end to ensure the knotted part of the yarn is under the hook. To hold the yarn you need to clasp your 3rd, 4th and 5th fingers to your palm, and straighten your index finger. You should now have 1 loop on your hook. This is the first stitch you count on your chain. Chain 5 loops onto your hook. 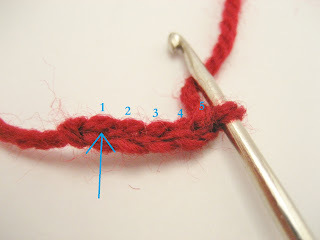 The arrow is pointing between the stitch where you need to insert your hook for the next step. Pull through 2 loops = 1 loop left! This is the 30 stitches from Round 2, now back at the marker you start counting from one again. Stretch the beanie so the tail can stretch out, cut off the reminder. You know how I said I popped the hook into the wrong part of the stitch, well the beanie on the bottom was the result. It does look like a beanie so I didn't realise anything was off for a while, and by then I had 3 beanies, anyways I like that crochet is forgiving. Hi Mel! 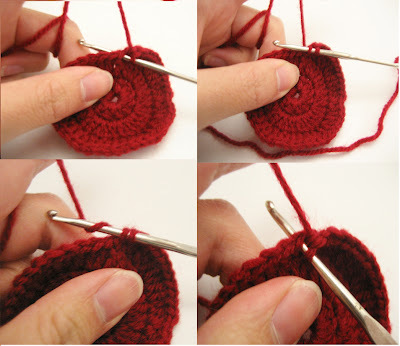 I love your step by step beanie tutorial! Would you mind if we used your tutorial and photos to help teach our volunteers to crotchet? More than happy to support a good cause, go ahead and use the pictures and tutorials! About how long did each hat take you?